Ecuador ( i/ˈɛkwədɔːr/ E-kwə-dawr, Spanish: [ekwaˈðor]), officially the Republic of Ecuador (Spanish: República del Ecuador, which literally translates as "Republic of the Equator"), is a representative democratic republic in northwestern South America, bordered by Colombia on the north, Peru on the east and south, and the Pacific Ocean to the west. 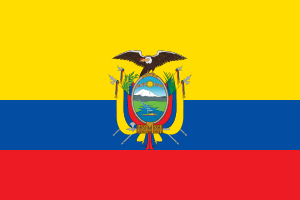 Ecuador also includes the Galápagos Islands in the Pacific, about 1,000 kilometres (620 mi) west of the mainland. What is now Ecuador was home to a variety of Amerindian groups that were gradually incorporated into the Inca Empire during the fifteenth century. The territory was colonized by Spain during the sixteenth century, achieving independence in 1820 as part of Gran Colombia, from which it emerged as its own sovereign state in 1830. The legacy of both empires is reflected in Ecuador's ethnically diverse population, with most of its 15.2 million people being mestizos, followed by large minorities of European, Amerindian, and African descendants. 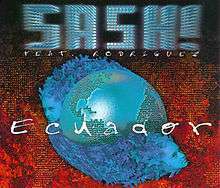 "Ecuador" is a song produced by German DJ/Production team Sash! that features Adrian Rodriguez. It was released in April 1997 as the third single from their debut album, It's My Life - The Album. The song became an international hit and reached the top 20 in more than ten countries worldwide. Being the follow-up single to the massively successful "Encore Une Fois", a lot was riding on this next Sash! release. The single was just as successful, and reached number 2 in the UK Singles Chart, earning another Gold certification for sales in excess of 400,000. The song became a European smash, reaching the top 10 in Germany, Switzerland, The Netherlands, Belgium (where it peaked at number 1), Sweden, Finland, Norway and Ireland. It also reached the top 20 in Austria and France. In the United States, it was the second number 1 on Hot Dance Club Play chart for Sash!. In 2005, the song was adapted by the Starstylers into their first single titled "Keep on moving".